THE INITIATION AND THE CAPTIVE PART I: Book One of The Secret Circle Trilogy. BEST SELLERS: Dark Visions Trilogy, The Night World, The Vampire Diaries and many more. Forced to move from sunny California to gloomy New England, Cassie longs for her old life. Even so, she feels a strange kinship to a terrifying group of teens who seem to rule her school. Initiated into the coven of witches that's controlled New Salem for hundred years, she's drawn into the Secret Circle, a thrill that's both intoxicating and deadly. even if it means that one wrong move could destroy her. EXCERPT: "It wasn't supposed to be this hot and humid on Cape Cod. Cassie had seen it in the guidebook; everything was supposed to be perfect here, like Camelot. Except, the guidebook added absently, for the poison ivy, and ticks, and green flies, and toxic shellfish, and undercurrents in seemingly peaceful water. The book had also warned against hiking out on narrow peninsulas because high tide could come along and strand you. But just at this moment Cassie would have given anything to be stranded on some peninsula jutting far out into the Atlantic Ocean—as long as Portia Bainbridge was on the other side. Cassie had never been so miserable in her life.......[T]he boy's voice startled her, "Life isn't fair," he said. Shocked, her eyes flew up to his face. His own eyes were as dark as the sea in a storm. She saw that clearly, and for a moment she was almost frightened, as if she had glimpsed something forbidden, something beyond her comprehension. But powerful. Something powerful and strange..."
MSM SPEAKS: Lisa Jane Smith, the Female Author who talks sense when she moves into the topic of Witches, Werewolves or Vampires. I had read The Night World Series of her's before and had absolutely loved it! Yes, I think she is one of the BEST YA writers' of all time. 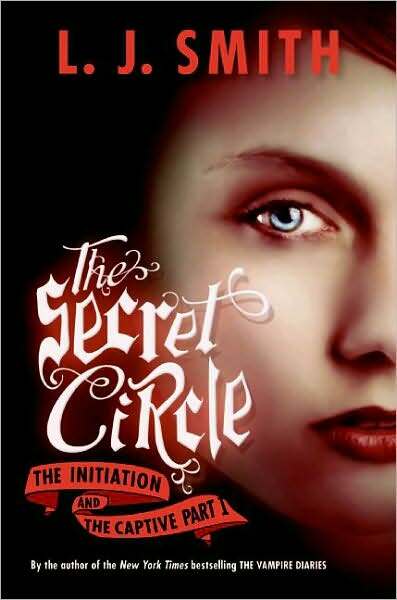 Coming to The Secret Circle, how is this any different from other Witch stories. First, there's no moping depressed teen, Cassie Blake takes life as it comes, yes, she is sad that she had to leave California, but she comes to terms slowly, not pining like certain Bella. Second, there is clarity and mystery in the plot, which makes the Reader think that he knows what's happening, but surprises spring up, breaking the predictable plot. New Salem, old and dingy, just opposite to California...and Cassie knows deep down, there's something different about the town and her old, rusty Grandmother - who looks like an Old Witch. But she is kind and Cassie tries to be polite to her. Cassie's mother falls sick and Cassie has to make new friends in the new school. However, she is nearly run over by the Club Member on a bike. A girl. And yet another, who is almost Feline when she moves. Almost ten such weird teens who seem to have control over the entire school and also how everyone treats Cassie. The Club. Cassie knows she wouldn't be caught dead in there. But, reality is far away from it. Caught up in a serious conflict, Cassie wishes she could find peace when she sees Diana. The Girl with sunlight and moonlight woven hair. The Girl who protects Cassie and loves her like an elder sister. The Girl, whom Cassie swears never to hurt. But then, fate has something else in store. A Magical memory born in California stirs up the forbidden temptation, which Cassie had never thought, she would have to fight. Will she cherish the memory and give up on the Girl she loves or forget whatever happened back in California, to save the Girl she loves more than herself? Apart from this, Cassie now knows that she could be a witch too...and that means, fighting the Dark Powers which the Club seeks to invoke, to redeem the wrong done to the witches for ages. The plot moves at a balanced pace, keeping the Reader intrigued. Initially I had thought this would be almost like the other such books, of the Genre, but no, it wasn't. The story picks up pace and has twists and turns which keep you coming back for more. Lisa writes in a manner, that you can finish the entire series in two days! I would recommend other works of L.J.Smith too, if you like YA Fiction. And no, she does not portray teens as dumb juvenile creatures, but people who think. Her Protagonists always appear weak but have very strong characters - their spirit to fight, love, hope and live are laced with underlying passion. MSM Recommends this. looks nice. Nicely done review. But YA. uh uh...you won't find me reading one of these....for a long long time. @FL: *Sigh* Believe me, it's not one of those boyfriend breakup sagas...give it a try no ;) :D :P Fine. Don't. :P You can just do with my reviews! :D Blehehe! :D Oh, Thanks by the way.